Life is darn busy, let me tell you. I seriously don’t know where the time goes. I mean, apparently it’s been a week since I last posted something. Hmm. I’m also super behind with my Dark Days posts. Between traveling & hardly cooking these days, it’s tough to pull it all together. But I’m working on it, I promise! Even though this dish isn’t 100% local–the kale and tomatoes are! Yup, local tomatoes in January in Appalachian Virginia! We’re lucky enough to have Yoder’s Hydroponics just up the mountain in Ruston, and my kale came from Roanoke county, so really, how much more wonderfully fresh can you get than that? And as for ease, as well as nutritional pack for punch, this couldn’t get much easier. The quinoa gives you a walloping dose of protein and the kale lends its delightful antioxidants, calcium, and beta carotene. It’s the perfect throw-together lunch or dinner for someone in a rush. Just cook the quinoa, add the veggies, and toss with your favorite salad dressing. Et voila! In a skillet, warm the olive oil over medium heat. Add the kale and sautee for 5-7 minutes until soft. Add salt & pepper to taste. Remove from heat. 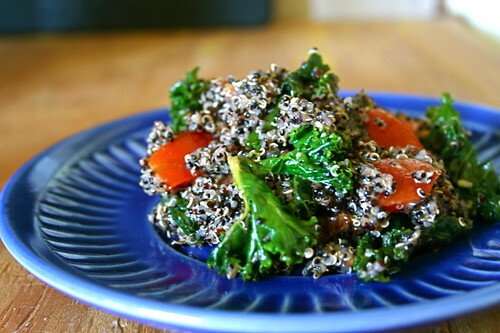 In a large bowl, combine the quinoa, tomato chunks, kale, and your salad dressing of choice. Toss to coat evenly and serve! Beautiful! I’ll trade you a couple of anise rolls for a plate of quinoa salad! Deal? Oooh this looks so simple and great! I might try making this with sundried tomatoes, since we’re out of fresh. And red quinoa, because that’s what we have on hand. You can even get fabulous pictures on Mark’s plywood counter-top!! We just started getting fresh veggies from a CSA that is in the City. Meat however has been much more difficult out here in San Diego. We have occasionaly riding up to La Jolla to buy from a local butcher, but it is really pricey, so we can’t get to much. Miss seeing you, hope all is well. I love the simplicity of this, Jes. And such a pretty, colorful dish for these monochrome winter days. Beautiful picture, as always, I don’t know how you get so much natural light at this time of year. Oh, this bright salad looks great for winter. I love warmed or lightly cooked tomatoes. Looks awesome! Yum! Love the Quinoa (although we can’t find it here so easily). Quinoa is one of my go-to foods, Jes. You’re lucky to have fresh tomatoes this time of year, even hydroponic ones. And kale is so satisfying. What a super salad! Fresh tomatoes, lucky you! Looks really yummy and so simple! Tomatoes and kale- so simple, yet so awesome together. I read a few posts back that you’ll be teaching, working, and doing graduate school now. I wish you good luck, I admire the fact that you are attempting to do so much. I don’t think I could handle it.